Continued soft demand and unenthusiastic customers had North America construction framing softwood lumber prices lower last week, as operators can only wait and see if the usual spring lumber selling will materialize. Monday’s data release of improved U.S. construction spending for February and recent data of strong US home sales and house prices has most wood suppliers thinking there is still a good buying season approaching for spring 2019. Be ahead of these data releases! Don’t delay, this week’s softwood lumber market comment was published to the website Monday morning. *Madison’s Lumber Prices, weekly, are a good forecast indicator of US home builder’s current lumber buying activity. Many players were “frustrated” that dimension lumber sales volumes were lower than expected even as weather in most regions of North America improved with the coming of spring. Sawmills reduced their asking prices more than $20 on some #2&Btr items, finding mild success with selling, and pushing production order files out no more than two weeks. Southern yellow pine (SYP) lumber prices continued to gain ground after three weeks of steady declines earlier in March. 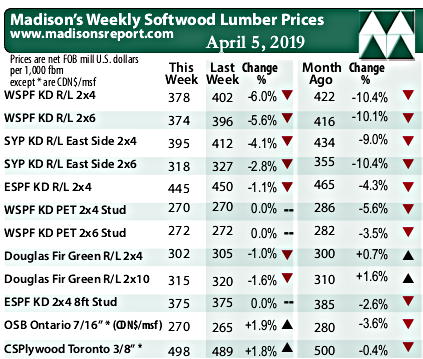 The Madison’s/Forest2Market composite southern yellow pine lumber price for the week ending March 29 was US$430 mfbm, a +2.6% increase from the previous week’s price of $419/MBF but an -8.5% decrease from the same week in 2018. Year-To-Date average price for SYP composite: US$410 mfbm. Prices of Kiln-Dried Douglas-fir lumber continued to slide this week as sawmills and buyers jockeyed in effort to find a tradable bottom. The tone of business was markedly “soft” while overall sales volumes were “OK”. As commodity prices dipped further and log prices advanced, KD fir producers got closer to the unenviable position that green fir mills were in: losing money on lumber just to keep on-ground inventories moving. Primary and secondary suppliers both had available wood – more so in the case of the latter – but were consigned to waiting for sold volumes to finally ship. The price of Douglas fir KD 2×4 #3/Utility R/L fell -$15, or -5%, to US$305 mfbm.